I just realized orcs, goblins and halflings weren't going to be part of this game. While I don't necessarily criticize this design decision, I was wondering what would you lose by adding them at least at character creation? They are at this point pretty much as "classic" as dwarves and elves in fantasy settings so why do you guys think they did not include them? Also, anyone knows if these races are out of this game or out of this universe entirely? No idea on orcs and goblins. They could be enemies you face in the game. No one knows for now. Halflings are out and seem to be replaced by Orlans. I'd like to see Halflings added later as they're one of my favourite classes, but it would have to make sense story wise. At least one of the devs doesn't like them which is a shame. I think this setting has enough high fantasy Tolkienism in it as it is. I enjoy that it's its own thing and not just the same races as everywhere. It gives it more character. I think adding more standard D&D races could quite possibly devalue it as a unique setting and discourage exploration in an "we've seen all these guys before anyway" fashion. Just my 2 cents. Feel free to disagree. The sky had never seemed so sky, the world had never seemed so world. They are at this point pretty much as "classic" as dwarves and elves in fantasy settings so why do you guys think they did not include them? Because Goblins and Orcs are lazy. The idea of an evil society devoted to conquest is beyond unrealistic. Furthermore, it leads to unrealistic conflicts. A small group of chosen warriors defend civilization against the illiterate, uneducated, unwashed masses, and other fantasy barf. This problem is aggravated when writers conclude that there must either be perpetual interspecies conflict, or that the solution is a rigid caste society. The only time they are done well is when they're given a distinct culture with conflicts that make sense, and PE already has enough heavy trope lifting to do. Each traditional fantasy element added has the significant risk of detracting from verisimilitude and makes the task of writing significantly harder. Bear in mind, the same criticism holds true of traditional elves; they're the inverse of orcs and just as unbelievable. Josh et. al seem to have had a significantly hard time making them interesting and relevant for that reason. But I would argue that elves are more core fantasy than orcs, because stories of elves and faeries played a significantly larger role in English canon than orcs. Dwarves don't have the same problem. They're different, but very obviously driven by human motivations. Interesting point of view that is quite logical too. But then, it all depends on how you design these races. For example in the Warcraft universe orcs are quite balanced, although in the Middle Earth one it's not: they're just the "generic" evil guys. But I really think that there are ways, if you want so, to integrate, at least orcs (maybe halflings too? ), in a realistic and satisfying way. And lastly, I don't necessarily think you have to flesh out an entire civilization to include some races. You could very well have an orcish civilization in a region far away, not in the game, and have some rare orcish mercenaries employed here and there and the orc race available in character creation. Anyway I don't necessarily criticize the design decision of not including them, I personally believe they could have been included while also maybe giving them a particular, new, fresh, PoE touch to them, if the designers wanted to do that. it's true that halflings have been somewhat put into the game in the form of orlans though. I would have liked orcs to be included only in character creation for example, that would have been cool with me and the game wouldn't have lost that much of personality.. I would like to reflect on something that you said though: "The idea of an evil society devoted to conquest is beyond unrealistic." I don't necessarily agree. Warcraft's Orcs, while interesting, revert to perpetual, unnecessary, and unsustainable war by cataclysm. Herding societies do give rise to antagonism, but total war is largely unsustainable in a historical context. Eventually the invaders from the steppes settle down and new invaders replace them. I.E. the Berbers took over Spain, but didn't maintain a state of continual mass conquest for 1000 years. Furthermore, there's a problem where fantasy races internalize historical and geographical factors as a racial trait and thus become less believable as a people. The idea of an always improvished, always aggressive, always invading intelligent species is pretty unbelievable. This is even worse with the Drow than the orcs, because they have so few surviving kids and so much internecine conflict, their society would collapse quickly. Finally, the Aumua play the role of a far away people that appear as mercenaries. I was wondering what would you lose by adding them at least at character creation? Equally, what would we gain? I don't think "classic" is the right word. "Derivative" maybe. It's a bit late to start adding races. The lore is already written and the beta is just around the corner. Shoehorning in major stuff at the last minute just makes for a sloppy experience. When in doubt, blame the elves. I would have liked orcs to be included only in character creation for example, that would have been cool with me and the game wouldn't have lost that much of personality..
Are you serious? Aside from having to create all new models (that the player will never see unless they use them for their character/s), your race matters to the setting. There may not be a lot of reactivity from NPCs but the game's creators put a lot of thought into the cultures and races of Eora, colonialism is one of the themes of the game, and a random race just stuck in would really not mesh. Also the Aumaua are the big "brutish" fantasy race of PoE and they are way better than orcs because they come in more colors than just green. Well, Orlans are pretty much halflings/goblins (the wild ones are goblins, and the civilized Orlans are halflings). Aumaua could pass as Orcs, I think. Or maybe they are more like ogres. The Aumaua are like fish Orcs. Well if there's one thing we need it's more vidya gaems with Orcs, n' elves, n' goblins and such. Look, I love Tolkien and Irish Faery stories as much as the next nerd, but it's OK for a game not to be stuffed with every generic trope from the last fifty years of literature, tabletop games and CRPGs. Embrace the differences people. Now if somebody wanted to make a proper Lovecraft/REH/CA Smith/Moorc.o.c.k.ian, swords & sorcery RPG set in an antediluvian Mythic Earth I'd be all over that particular trope, which has never really gotten its proper due in role-playing vidya gaems. The name of Micheal John Moorc.o.c.k should not be a swear word folks. *shrugs* Personally, I'd be more than happy to get a few good rpgs out of Middle Earth. I'm not campaigning for their inclusion by any means, but some of the above responses with the flavour "Do something new, not derivative" seem to be rather at odds with a game that is a) Deliberately retro, and b) Containing Elves, Dwarves, Trolls, Dragons and Ogres. PoE is not only "derivative" but is purposefully so. Well for one halflings are ugly midgets and were never cool to begin with outside of the lotr story. All these races are overdone in fantasy what is the point adding them over new creatures. Well, but orcs are so cool too.. There's something "strenght and honor"ish about them.. The last time I found Orc's well implemented in a gameworld was probably Arcanum, i'd be for such implementation in Poe but not the WOW sort or other varieties. Damn straight. If you have to have orcs, at least let them unionize. You can apply that strength and honor to some new race and there you go. Personally I think it be funny to see a highly intelligent chimpanzee race inspired from planet of the apes. Not related at all to human races in origin and are total **** to colonists they capture and humiliate with chimp grunts and throwing poop at them. Basically a goofy playful monkey race. If you give the equivalent of an orc/goblin a eusocial evolutionary structure, then I think their behavior becomes more sustainable. They would then be acting more in the interests of the colony than as individuals. Therefore a belligerent territorial aggressiveness can be sustained by repeated spawning of new generations by the reproductive caste, and the loss of a significant number of individuals might not significantly damage the whole. They can also produce plague-like incursion cycles, such as occur with locusts under some environmental conditions. That's a fascinating concept that I would love to see explored. Weren't the orks in 40k something like the decayed remnants of a eusocial culture? To be fair though this is the failure of the fantasy genre to get elves, or to portray them as complex creatures, at least from Tolkien`s perspective. If you read Silmarillion for example, the elves there are about as different from run of the mill fantasy elves in games as you can imagine. If you could do elves like that they would certainly not be boring. Jon Irenicus is probably the closest I`ve seen to getting there in any computer game at least, and he was also not boring. When this becomes a problem with any race or class it is because there`s no proper vision. Orcs are the same, and usually incredibly dull and generic. But Tolkien`s orcs were not dull and generic, but had complexity, both within each character and socially. It`s all down to the writing, and you can make all this stuff very interesting or very dull. I would agree about Tolkien's elves, at least in the Silmarillion, but it's been ten years since I've read any Tolkein so my recollections may be off. There's a very interesting contrast between them being angry ****ups who are destined to fail and their seeming perfection to human observers (although this varies from work to work). However, I never got the same picture of the orcs, which were corrupted elves who spoke a language that was a corrupted form of elven. They seemed to live in material and cultural poverty, and it doesn't seem like Sam gained any insights into their culture when he pretended to be one. Because then you'd also see a siht storm of "black people portrayed as stupid monkeys", vendors would decide to do the right thing and not carry the game. It wouldn't matter at all if the game would also have black people portrayed as black people with superior intellect and angel like presence. Because that's how things work, take one thing out of context and go crazy. BTW. I'm perfectly OK and happy to see orcs and goblins and such in a fantasy game. making up cultural differences and oppression and reasonings and stuff, when things go south and fail. They wont fit well into a super realistic scenario where everyone has mixed motivations and all. More fun games, where orcs are orcs, skeletons are skeletons and bandits have black hoods and live in a bandit camp. 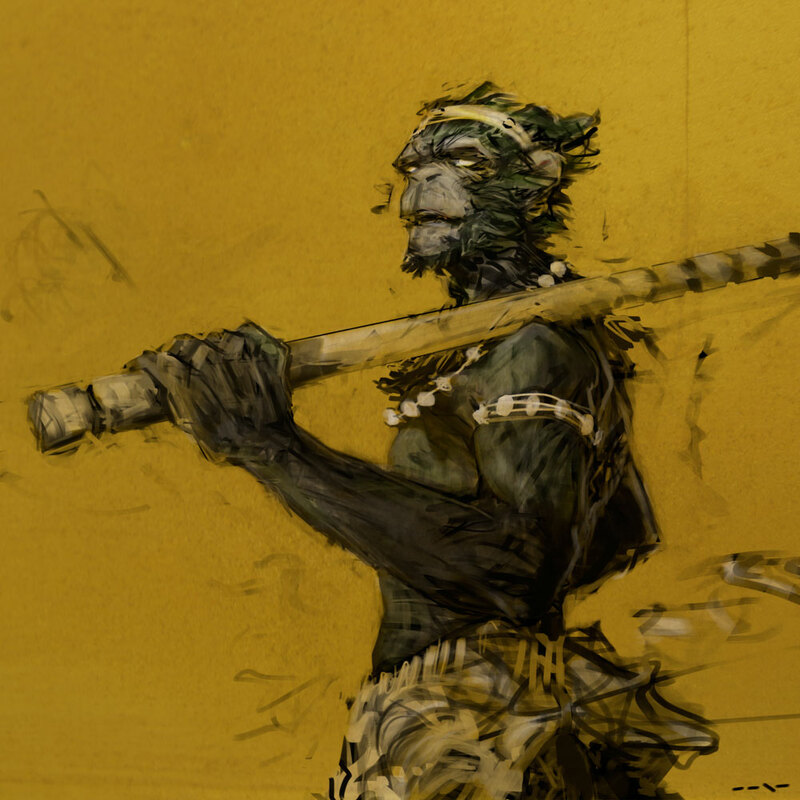 I would actually like a RPG where there wasn't any humans, but the other "regular" fantasy races could show up, as well as that Sun Wukong idea above. It'd be cool, I think.